Around Thanksgiving, Susanna and I (with assistance from my dad) ordered new kitchen cabinets from Home Depot . I got a call this week that the cabinets were ready to be picked up. My ultimate goal is to make cabinets when we redo the kitchen, but for now, it was easier to get new stock cabinets to make the one side of the kitchen as usable as possible. 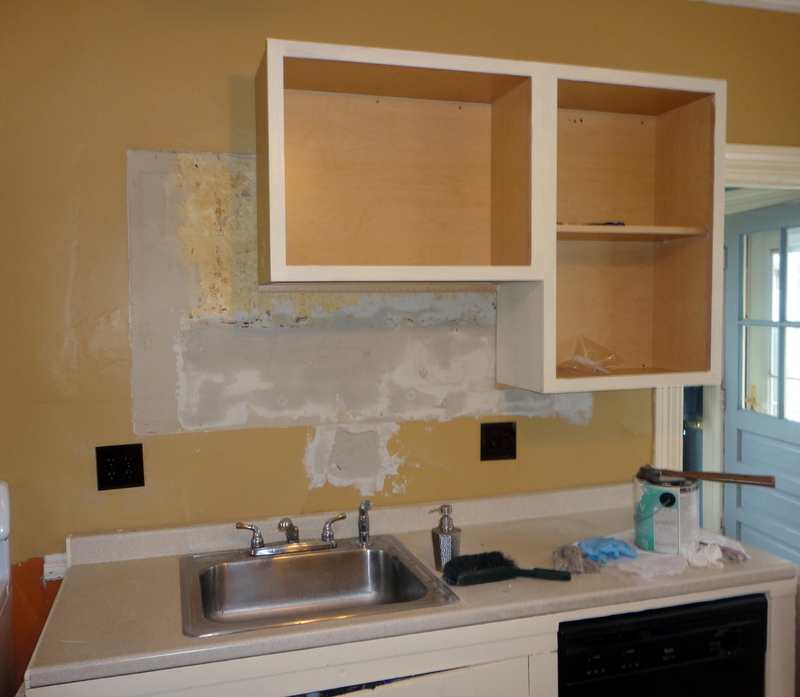 It will probably be a couple of years before we are able to redo the kitchen. The first thing I noticed at the store was that there were only 7 cabinets in the stack, not the 8 that the drawing showed. After a careful look, it appeared that we (and the store) didn’t order one of the upper cabinets needed (both of our faults – I thought we had double checked the list – but one wasn’t on the order). Hopefully the missing cabinet won’t take too long to arrive at the store. Susanna and I pulled down the old upper cabinet. Unfortunately, we pulled it down before I went to the store – I would probably have waited until all the uppers were in before taking down the old one. I also learned to not leave upper cabinets hanging with two screws half way in while I run to the workshop for more tools. I also learned that when the upper cabinet falls (it was at least empty) that it won’t be in a condition to reuse in the laundry room. The crash also scares Susanna half to death. The wall behind the old cabinet was in pretty bad shape. I installed plaster washers wherever the plaster had come loose from the lath. 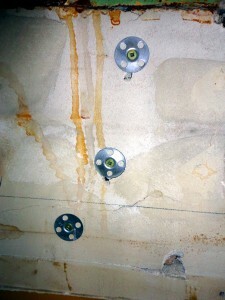 I then did a first coat on patching the wall using drywall compound. I was able to install two of the upper cabinets today as well. The middle upper cabinet is the one missing. Normally I would hang the cabinets from the corner out, but in this case, I need the cabinets as far to the right as possible to line up the lower cabinets. I will add a spacer to make up the gap between the final cabinet and the wall. Depending on when the other upper cabinet arrives, I may go ahead and install the lower cabinets and new counter top next weekend. 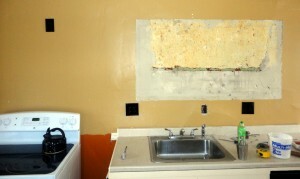 We will reuse the sink and none of the plumbing should have to move. Overall, I didn’t get as far today as I had hoped. I was hoping to get all the uppers installed, but of course that couldn’t happen. 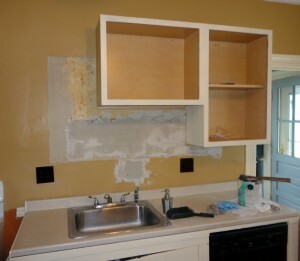 I didn’t want to dig into installing the lower cabinets today and leave the kitchen a total wreck for the week. Hopefully all this will be done by Christmas. Don’t worry, I’m pretty confident that it shouldn’t be a problem to get done by then.